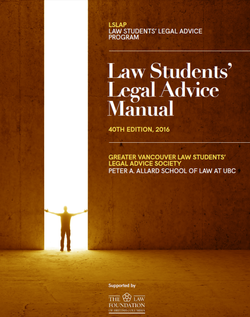 The Law Students' Legal Advice Program's (LSLAP) Annual Manual provides quick answers to many legal issues. It is made up of 22 chapters which amount to over 1,000 pages of printed materials. Originally designed as an educational resource for LSLAP students, it is now used by hundreds of organizations across British Columbia. Clicklaw Wikibooks and LSLAP have joined efforts to bring the Manual to the Clicklaw Wikibooks platform. This page was last edited on 16 August 2018, at 19:36.